Onion is a nick name given to Greg based off his username, Onision. Ever since Greg's YouTube channel gained popularity, people misread his username as "onion". Even today, fans suffer from auto-correcting his name to onion. To spite Greg and his (at the time) known hatred for the mispronunciation of his username Onision, anti-Onision vloggers and later bloggers started calling him "Onion". For years it was associated by Greg and fans as a hater term. Because of his "Onion" nickname, it began a strange association with Greg and the popular movie character Shrek's quote, "Ogres are like onions." 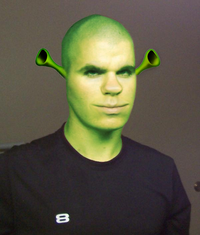 (Source) This eventually lead into odd photoshopped images of Greg combined with Shrek to spread on message boards and blogs. This page was last modified on 5 September 2015, at 21:08.